The second cave campsite is an optional overnight resting point or campsite that is situated along the Rongai hiking route of mt. Kilimanjaro. Here we say "optional" because hikers have the option of spending the night here or moving forward to the next campsite, in which case this camp is used as a lunch spot. As it is located along a low traffic route, it is not a very large campsite compared to those located along high traffic routes such as horombo huts. The second cave campsite is only used by hikers on the Rongai route and there is no built accommodation, thus hikers intending to spend the night here would be carrying their own tents (or carried by porters). There also is no water supply at the camp, thus the only toilets available are about 4 pit latrines. It is named due to its proximity to a cave that was previously used as accommodation in the earlier days of Kilimanjaro hiking, but the park has since then banned any use of the caves for safety reasons. 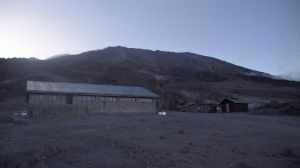 The Second cave campsite is located in the northern eastern part of Kilimanjaro. It is also in the moorland zone of the mountain, an area with only short vegetation. The previous camp before this would be Simba campsite, while the next after this would either be the Third cave campsite or Kikelelwa campsite, depending on which variation of the Rongai route being taken. Are you associated with Second Cave campsite? Contact us to improve this page or create another page for your business.